"A very powerful, efficient and the best frame work for Java"
There is not much to say about the defeciences of Spring boot as it's benefits supercedes it's defects. But I would point out that the programmers have become lazy and many developers have been avoiding complex algorithms and instead taking a easier path by using built in APIS in frameworks. This is not a problem at application level but could be a problem to developers career. Microservices, dynamically loading up and down of instances, dependency jars. Etc..
"I love it! Makes microservice development quick and easy." I love Spring Boot Projects! Makes development really easy and you can code and have a simple server up and running in a few minutes if you wanted. With spring initializer, you can choose what is included and so your Spring Boot projects works out of the box, Spend more time on business logic and less time on xml configurations. Also the Spring Tool Suite eclipse plugin that features a Boot Dashboard and being able to see which service is up and on which port. It's a lot easier than changing tabs through all your microservices to see which one is running and which port is taken. Different versions of documentation floating around can be misleading. Older Spring Boot versions don't have support for certain libraries, syntax or features so it would be nice to have one documentation that specifies which version works with such. Developing microservices for our software architecture. We have realized the speed and efficiency of switching from the traditional Spring to Spring Boot. "Spring boot: making developer's life easy"
I like everything about spring. For those who are not aware of spring boot- it's a frame work which helps you to write spring codes. For those who don't know what is spring- it's a java based framework. Spring boot is a full-fledged framework. It have embedded tomact server and H2 data base, using which you can create your application in most less lines possible. Spring boot have all features of spring and the best thing it does is makings things more configurable with just a use of single annotation. I believe it's a must use for developers who are in to java careers. I like the fact that it makes developer's life easier but it has made things so abstract that a beginner not will understand core of java and JDBC on which almost every application depends. I will suggest it only for intermediate group who know basics of springs. For beginners it's not a tool I will say. I will recommend to learn spring after someone is comfortable with core Java and basics for websrvices. We are making a restaurant application. "Awesome java framework to spend your time on coding your business instead of configuration"
It really helps me focus on my business features instead of worrying about configuration, boilerplate code and thinks like those. Moreover it has a great system of metrics, that show you what is going on in your application. In addition you can extend that mechanism to provide your own metrics. Its startup process is a bit slow, and the result jar is heavy (more than twenty MB). If you need a Java framework to build a robust application as fast as possible, stop looking for, Spring Boot is your best choice. Build a software application using an agile approach, making continuous deployments of features and improvements. "Best Product which easy to use with no XML configuration"
2. Run enterprise application instantaneously. 3. Easy to develop maintenance and debug a Spring application. There is nothing to dislike however integration and support with Hadoop would be great. Spring boot is extremely easy to setup and use in order to develop enterprise Spring application from ground up. There is no manual configuration and application can be easily developed with minimal effort. Hence my recomdetation for all developers to give a try and I am sure Spring Boot can help you to minimise your development effort. Developing and analyzing enterprise level Spring application without doing a lot of configuration which is error-prone. It's a full-fledged and powerful framework for Java application development. It's self container too for multiple development purposes. It's a boon to Micro-services application architecture. Much easier to configure and do code using this. Avoid a lot of boilerplate code. Helps developer in managing various resources/pools efficiently and easily. Configure resources based on what it finds in your class-path. Annotation based implementation really helps in code maintenance. Sometimes configuration looks like over killing as developer. Rest it's great! Learn Spring if working on Java application development. "Great IOC Container for Microservices"
Limited Container choices (Only Tomcat, Jetty or Undertow is supported). Cannot be integrated with other licensed containers like Weblogic, Websphere, JBoss etc., A bit of a steep learning curve to understand the out of the box features. Made the Microservices development a breeze. "Used to build microservices and standalone java applications"
If you are coming from the Java world, it does not require lot of effort to start building your own standalone application. It only requires Spring knowledge, which can be a bit complex. If you have knowledge about Spring, you are ready for coding. I love the simplicity when building with Spring Boot. By default, it gives you lot of things out of he box which you can configure if interested: metrics, content negotiation, marshaling, caching, social features, etc. The documentation is first class and the tutorials on the web can make you start building production ready features in a afternoon. The team that is behind Spring is also quite reachable through Twitter and very knowledgeable. Sometimes Spring Boot can do some 'magic' behind the scenes. Things like Autoconfiguration or dynamic repository implementation can give you a false sense of your app working correctly. Although this is something optional through annotations. If anything I noticed I would change is the amount of dependencies it pulls and the number of classes loaded in memory. For junior developers, if they don't know Spring, the learning curve may be a bit steep. I would recommend to start learning Spring and its philosophy. After that, It is enough an afternoon working with Spring boot to start realizing you can get the work done quickly and in a robust way. I work building microservices for integrating data with external parties as well as exposing services internally. My day to day consists on applications producing and consuming data from message queues. Use Spring boot for personal projects as well, normally when a rest api needs to be exposed as part of the backend services. "Forget about the boilerplate code; just write your business logic"
For the first time I kept the Spring's application config to a minimum. Typesafe configuration to govern and validate configuration properties. Autoconfigured DispatcherServlet, view resolvers, servlet filters, exception handlers, and logger output. Built-in production-ready features to manage and monitor you application when it is pushed to production (threads dump, health check, http requests statistics, and other metrics). The autoconfigured DispatcherServlet cannot parse dates in ISO 8601 format which is de factor standard for JSON over HTTP(S) communication. Spring Boot may not fit them all but is definitely worth a try. The application requirement was for a data warehouse monitor accessible through a Web browser. The users of the application are administrators and managers who in the course of their work need to view and manage processes and scripts that load data into the data warehouse databases. With Spring Boot I managed to quickly deliver platform-independent application distributed as a JAR file with a self-documenting YAML configuration file. The application runs on Windows as well as AIX. The admins can decide whether to run the application in a recommended stand-alone mode or deploy it to an existing web container or application server. I charged my customer for the time spent on implementing business and data retrieval logic; not the time spent on writing a boilerplate code or dealing with integration and installation issues. "spring boot is doing it's job in spring framework product penetration"
Most of spring boot I appreciate ease of use. Core Spring framework itself is somewhat complicated. And without a long learning it's hard to even try. Spring boot makes it easier to start the journey. it's also excellent for rapid web app testing and development. Perfect for hackatons. With recent version 1.3 it's even more awesome. Allowing fast code redeployment. I had not found anything particular so far I would be displeased about. It's free software and doing it's job. Spring Boot team is frequently updating it's child and that's the reason I'm happy about it. As I mentioned earlier recently we've got version 1.3 which brings many new features. Check them out. It's worth to use spring boot, while it makes configuration of spring framework stupid easy. For small projects it's really great. For bigger you will possibly switch to core Spring framework. For the time being I just make personal projects and building up portfolio, so I will be able to get the best possible job. Last project I used spring-boot for was a Rest Backend service. My Spring Boot app communicated using JAX-WS with a SOAP Service, collected data and served it as a nice REST to mobile app. I have deployed it on Pivotal Cloud Foundry service in really short time. I was amazed how fast i did that. "Spring Boot modern dev experience to Java"
Hello world path is trivial. Getting started with Java projects can be frustrating. Boot has done a good job of addressing that issue. Automagically binding DBs and other beans is also awesome for kicking the tires. This results in gradual intro to the complexity rather than having to deal with everything on day 1. Also, the ability to create a runnable jar is awesome and portable. The residual mem requirements are quite beefy compared to Boot alternatives. If you're a Spring shop then switching to Boot will yield a lot of value. If you're considering Spring, then understand that on the Performance vs. Ease spectrum, Spring optimizes for Ease of use. Quick ramp up for new team members. Convention over Configuration philosophy from rails. "From the view of a Java EE developer"
For short, very fast in development speed. Spring boot integrated many library I need for server side development. Just add the dependency lib spring-boot-starter* to my pom file, edit the application.yml to config the lib. And I got the basic infrastructure to code. Actually, Spring boot is a parent for many other spring based product. For normal web application, I will need spring-starter-web, to use thymeleaf - the greate template engine - add spring-boot-starter-thymeleaf to my maven dependencies. And so on for database, security, message bus (active mq, rabbitmq). One other great of spring-boot is spring cloud, integrated with netflix cloud. Need to know, even I do not yet deploy all my products to cloud. Support for spring boot is good on stack overflow. Just add a question, you will sure got answer. As I write code use other open source software, like Akka or Vertx, I see spring-boot is just a normal lib. No reactive programming, depends on legendary java servlet - that mean a web request will take a java thread for execute. So I can't make any 10k request per second. Even a Hello world! For anybody want to develop & deploy fast Java server side application. "Easily build enterprise applications with near zero installation effort"
Zero installation and publishing effort. The biggest advantage, IMHO, is defenitely the easy installation and the rapid setup of a RESTful service, if you ever had to configure a JBoss Tomcat Server, you will appreciate that even more. You can customize and override everything to your need and Spring Boot is constantly and improved by it's great developers. Use Oliver Gierke's Spring Restbucks reference implementatoins on Github and use the excellent Spring Boot Documentation. In my opinion it's best suited for CRUD REST applications. As a frontend technology I would suggest Thymeleaf and AngularJS, but most importantly keep your REST backend independent of your frontend, since frontend technologies can change fast. Try to cooperate with more experienced Spring Boot developers to get more insight and also try to keep up to date with the rapid updates on the Framework. In the end you will have a single jar file that can be easily deployd into the cloud or integrated into docker. The downsides are that it uses a couple hunderd MBs of RAM by default, so if you are low on RAM, maybe look for something more lightweight. Apart from that I would recommend this framework to everyone who has to build large scale webapplications and wants to rely and long-term support by the community. Custom developed web applications for small and big companies. I use Spring Boot in combination with an AngularJs frontend. "Used as an accelerator for microservices"
Documentation is great, it is fast and supports many libraries and external frameworks. One of the most important feature is that Spring Boot supports thee vast majority of frameworks with ease and with a lot of documentation on both the official site and on other sites like stack overflow, etc. The community is great, and the team behind spring is very likely ready to answer your questions or doubts. Also, if you write some comments or open some tickets on github, they answer very fast! Thanks a lot for your work. It would be nice to have different tutorials for advanced users and for starter users. Also, it is better to suggest and/or improve standard ways to create microservices with IDEs and improve the gradle support. It is better to learn how the standard spring framework works, at least study a bit of theory about dependency inversion and Inversion of Control. Developing microservices in a research project. Developing services in lesser time and with high quality. The research project is Temotec: TEMOTEC is the Italian acronym of the Technologies and Models for protecting Cultural Ecosystems Project and it was founded with the goal of promoting research and pre-competitive development in order to define and experiment with models and technologies for the protection, preservation and promotion of the "Cultural Ecosystems". One of the innovative tools and value added services introduced by the project is represented by a common basic framework that collects and makes available the latest methods and technologies in the field of automatic processing of information. "Spring boo when building microservices"
Spring boot and its simple convention-over-configuration approach that allows developers to pick the parts of the framework that are needed as "starters" which are included to the project and with very little or no configuration are ready to be used. The framework is able to build a deployable as runnable Java file with a self-contained web server that allows to deploy the app as an autonomous and independent process. When it comes to build a distributed architecture and inter-connected services, the Spring Cloud extensions provide a great help to build service discovery, registration, configuration management, load-balancing, fault tolerance, etc. aware of the dependencies imported transitively as some combinations may cause conflicts, Maven exclusions for transitive dependencies comes handy in these cases. 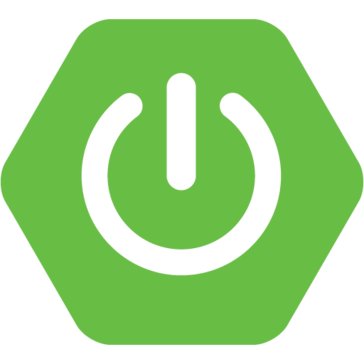 As a backend/API developer, I've been using spring boot with java 8 for more that 1 year to migrate a monolitith to a microservices architecture and it helped me to deliver production ready microservices in a couple of weeks. "Develop micro-service by leveraging Spring powerful features with SpringBoot is very simple"
SpringBoot give java developer a very simply way to develop micro service and every enterprise feature is easy to enable by adding a few maven dependencies and annotations. Startup for some complex application may take a few seconds to finish server up due to full class scanning. I know there is some progress in optimizing this and looking forward for the feature ready. We are trying to devlop internal talent management system with micro-service architecture. It make system modules development easy and clear. "Easy to create new application from scratch using springboot." Dependencies are added automatically based on functionality selected.Also dependencies are shrinked to single from multiple based on feature selected which makes pom.xml clean and easy to read. Spring boot has lot other capabilities which can be extended for effective and faster development time for developer which is a bless. Need to know which dependency for add for which functionality after project creation is little tricky its comes with lot of practices and experience. Not much effective documentation i believe. Developing multiple spring based project from scratch using modern technologies. "Spring Boot speeds up the Software development process." I like the idea of working with the Spring core library, but without XML configuration files. Annotations and convention over configuration speeds up the development process. I would like to have more documentation an Support, Spring Boot documentation is just too simple and I encounter myself googling every time I get stuck. Yes, Spring Boot is a great tool that has improve our delivery time and productivity. Focusing on coding instead of configuring a framework, that's the most important feature of Spring Boot for me. "Thoroughly enjoy the simplicity of configuration"
I've worked with the Spring Framework for about 3 years now and I've found it to be very configuration heavy and boiler plate code heavy. I've found Spring to be unbelievably powerful and once it is up and running you can save ample time developing enterprise level applications with it. A common problem I faced early on with Spring, and a lot of developers I know continue to face is that getting Spring configured properly. I how Spring boot has addressed this by putting heavy emphasis on minimal configuration. Instead of having multiple XML files as with the classic Spring Framework, Spring boot incredibly looks into the class path and provides default configuration based on the technologies I'm using. I find this ease of configuration to be a welcome change. The @SpringBootApplication annotation is also a wonderful means of condensing multiple annotations. Spring boot is still very new, I am finding it hard to sell my manager on taking the technology for a test drive on an application. I haven't been able to find many examples of applications using Spring boot. More documentation would also be nice, especially for those of us who work in locations that are not necessarily up to date with the latest cutting edge technologies. You need to try it out first. Currently our issue is applications which are falling behind the industry. Running Java 6 on our weblogic server, vast majority of our portfolio continuing to work with raw servlets as opposed to spring-mvc, using JDBC instead of an ORM provider, etc etc. The reluctance of many developers to pick up Spring here is due to configuration issues. While we have not attempted to build a production application using Spring Boot as of yet, I am continuing to test it and find its relative ease of configuration to be a strong sell point. I am hoping to have this technology integrated into our department sometime soon. Embedded application servers makes it easy to run standalone web applications. Easy to develop a project. We can focus just on the business logic. No complex xml configurations. Beans like data source beans are automatically configured. As a developer it’s good to know all the configurations that we’re set up from beginning. As spring boot set it up for us it will be difficult for a beginner to customize the configurations. "Lightweigt, easy to get started"
The ease with which we can get started and removes the complexity to add the boilerplate code. Simple to use and the Spring developers can get started without much effort. Developing micro services is easy and it is ideal for that. It is a great start to get started with the Spring Application Frameworks. With all the goodness of the Spring Boot, I am still skeptical to use it for a production scale applications but it is definitely an awesome choice for the personal projects. Try it undoubtedly when you want to develop micro services or you want to expose a few REST endpoints. I am working on my own projects and trying to develop a tool for students to maintain their portfolio and all of their information at one place. It is working well till now. "The Best way write code Java"
We are working with this framework to create projects that run in a ecosystem of micro services; for this case Spring Boot allow to we configuration and deploy endpoint of way easily and quickly. It makes coding much easier, faster. Project is structured and more manageable. Lots of option to plug with other spring projects. Like embedded tomcat. Tough to setup Spring jobs template and spring jpa in single project. If you are a Java shop take a look at it, you will like it, use it for sure. We create restful micro services with spring boot. Makes ci/cd more efficient, just one archive, deploy and just start with embedded tomcat. It is so easy, make life simple. "Easy and fast application develop"
It`s so dificulto do say, but the only thing i dislike is some auto configurations like thymeleaf (in my opnion is some dificult to override). In the other hands (spring-oauth2) have many classes without @Component or @Service its so dificult to cusotomize some features. "By Spring Boot I could write rest service as it should be"
It provides out-of-box integration function with database, security, authentication etc. It is friendly to dev-ops. Doesn't have a maven archetype to create a new project. The command line tool isn't so straightforward to install. Also there maybe some bugs when running a new project on windows, it shows error page without detail error message. Use the command line tool. We are developing marketing product. Spring Boot save us lots of time. "It's a rapidy way to develop Java Web Applications." The best part of use Spring Boot is all benefits of Spring, but without all configuration code that retard the application development. Otherwise, does not have a great documention about the framework. And if you don't know a little bit of original Spring, you will not know what's happen in back of framework. I'd have development a social network, but not on production enviroment, and I like the possibilite of work like using another agile framework, like RoR. In development, randomizing http running ports would be great. "spring boot for rapid and quality of web app development"
as developer, I would like to know the basic idea about how to implement the function, and how to customize or extend the function, which means if there are more examples or more books, I could deeply dig out spring boot. spring boot as back-end to expose RESTful API, the front-end could be web portal, mobile native app, or even wearable device. which means my system is a connected system. "Great framework for developers "
I like everything about spring boot. easy to configure. XMLs are no longer required. easy auto configuration. great dependency management. Easy to understand. saves lot of development time. Spring boot has made developers life so easy that actually there is nothing to dislike. I use spring boot to develop java microservices applications. The pre written starter kits are very handful and give you guns from day 1 of development. Due to rapid development of spring boot things are changing at a rapid pace. It is sometime tough to find the exact documentation one is looking for. If one is building apps using Spring then it is highly recommended to switch to spring-boot for ease of development. Using spring boot as of now for quickly building prototypes and then getting it validated from end user/customer of the product. "1 Year with Spring Boot"
I liked the Spring boot rapid development style. With Spring Boot we can quickly and manually create a new project. And it works perfect with Spring family. Spring Security and Spring REST is my favorites. Integration. it's a little bit difficult with spring boot. Spring boot is a rapid development and Strong Java Platform. I am a developer of our website and APP. we are using REST API to manage all APP requests. we also planning to use Spring boot on our next project. "This is the best structure and simple to development a system in java"
- There ins't support with cluster and share sessions of spirng-security. "Very quickly get an app from concept to production"
would like to see better reactive integration like spring reactor or rxjava. Vert.x support would be nice. I love how simple it is. It does a lot of hard work for you. No complaints as of now, though I’m still learning the software. Allows us to build applications easily while being more effective than eclipse. "Working with multiple spring boot apps on a daily basis. Building new ones based on a skeleton." Annotations are on one of the best features they have, so don't need to build a bycicle every time. Easy to start, often updates. A lot of code and sometimes difficult project structure if you maintain conventions. Dont afraid to start. Great for microservices. Robust appliactions, easy to debug, compatible with groovy, lots of libraries. "Fast production-lize your prove of concept. " Lots of examples and use cases studys. Both Maven and Gradle support. Less documents and examples with latest version,maybe lack of community contributions. Javaer must have a try! * We monitor all Spring Boot reviews to prevent fraudulent reviews and keep review quality high. We do not post reviews by company employees or direct competitors. Validated reviews require the user to submit a screenshot of the product containing their user ID, in order to verify a user is an actual user of the product. Hi there! Are you looking to implement a solution like Spring Boot?